The spring books have been getting some love this week so I thought I'd share what's in our spring book basket. 3. Over in the Meadow ~ Ezra Jack Keats - Lovely illustrations set to a familiar rhyme, my kids enjoy singing along to it. 4. Easter ~ Fiona French - love this book! but I already blogged about that. 5. Spring's Sprung ~ Lynn Plourde - I admit that I enjoy the illustrations in this book, more than the story. I live with squabbling enough without having to read it as well. Who knows, maybe it helps them work through their issues though. 6. The Tiny Seed ~ Eric Carle - We're huge Carle fans and this one's no exception. Elizabeth used to compare every seed she saw to the ones in this book, trying to determine where they'd land. 7. 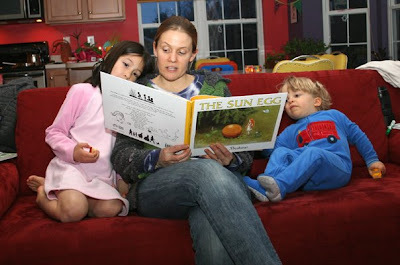 First The Egg ~ Laura Vaccaro Seeger - not really so much a spring book, although it does have eggs and chickens. Paul's mom sent it recently, and the kids love watching one picture become part of the next. 8. The Sun Seed ~ Jan Schubert - One of my favorites. What this woman can't do with felt! Gorgeous pictures and the story reminds me of Elizabeth's sunflower seed harvesting obsession. 9. Pelle's New Suit ~ Elsa Beskow - Great story of a boy who works his way into a new coat, following all the steps of turning a sheep's wool into a new blue coat. Wonderful! 10. Spring ~ Gerda Muller - There hasn't been a book yet in this wordless book series that Finn hasn't loved. He was a bit concerned about where the dog went, but the photos just ooze spring-y joy. I love The Sun Egg and Pelle's New Suit! I think a little elf got into my clementines and sucked their juice out! Great books! I especially love Elsa Beskow and Eric Carle. I can feel the softness of the yarn through the computer. 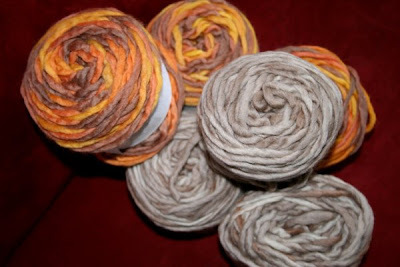 I am so glad you love the wool, I can't wait to see what you knit with it! Those books look great! I love the Elsa Beskow books. I love finding new reads. You have some books listed here that I haven't heard of, so will definitely need to check out! 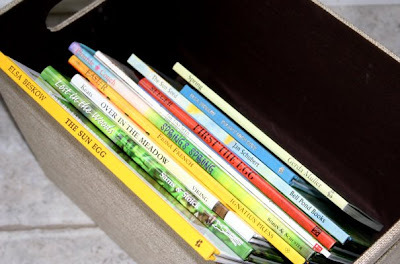 I've had trouble finding good spring books for school...I'm going to run with your suggestions to the book store. This is a great list of books...I think our kids have similar taste. I missed out on the Gerda Mueller books when my kids were Finn's age. Do you think they're too young for a five year old? thank you for sharing your list of spring books. i am always on the lookout for new titles. Thanks for the Spring book inspiration! I really want to get The Sun Egg soon. We love Pelle's New Suit. Great book list! Thanks for that I'm going to see if I can get hold of some of these and make a seasonal book basket too.